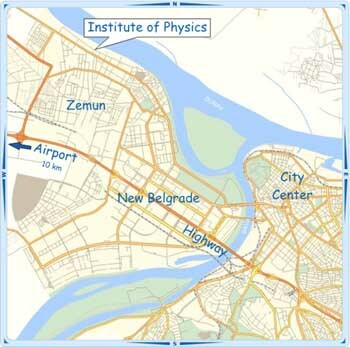 The Center for Solid State Physics and New Materials (CSSPNM) is a part of the Institute of Physics at the University of Belgrade. Our research interest is mainly concerned with the study of optical, transport and magnetic properties of a wide group of materials (from semiconductors and high-temperature superconductors to insulators and magnetic materials). The principal interests of the Center are the vibrational properties of these materials. The present experimental methods include the Brillouin and Raman scattering, photoluminescence, ellipsometry, optical reflectivity and transmission measurements (from far-infrared to UV spectral range), AFM and STM measurements, as well as other optical measurements in a wide spectral range under high pressure and low temperatures. In addition, magnetic and transport properties are investigated using the 14 Tesla cryogenic free magnetic system and the Hall-effect set-up, respectively. There is also a substantial theoretical effort in computing the phonon and magnon dispersions of the materials under investigation. The CSSPNM also uses different techniques for the synthesis of samples including sintering methods, sol-gel technology, single crystal growth techniques (Bridgman, Czochralski, floating zone, etc. ), thin-film technology (thermal evaporation and spattering) including photolithography and impurity doping. The topics in the focus of recent activities are the theoretical and experimental studies and numerical simulations of various properties of nanostructured systems like high-k wide band gap semiconductors and insulators (such as CeO2, TiO2, ZnO), nanosized ferroics as BiFeO3 doped with different rare earth elements such as Nd, Gd, Sm and Y. The vibrational, magnetic and electronic properties of strongly correlated electron systems (vanadates, titanates, manganates), the light scattering by spin waves in oxides, impurity effects in semiconductors and high Tc superconductors, to mention just a few of them, are subject of our permanent interest. Properties of photonic and meta-materials are also some of the main investigation directions in our research.